Weekly comic books are a big part of my life and below is a list of what I’ll be picking up this Wednesday along with cover artwork and previews courtesy of Comixology’s Pull List app. Our hearts go out to everyone impacted by Hurricane Sandy. Let’s hope talking about comics can provide a nice break from all of the tragic stories coming out of the past two days here on the East Coast. Have a safe and happy Halloween. A+X #1 – Not sure how long I’m on board for this series, but I like the idea of getting two Avengers/X-Men team-ups every month. Kicking it off with Cable and Captain America is really appealing, I just hope this story channels the spirit of Cable and Deadpool #25 more than Avengers: X-Sanction #1 . This book is also shipping with seven different covers, and the Mike Deodato variant is something I might track down. AQUAMAN #13 – I’ve been debating whether to drop this series for a few months now, and with The Others storyline wrapping up here it seemed like the right time. An upcoming crossover with Justice League may have me sticking around for a few more issues. AvX: CONSEQUENCES #4 – This follow up to AvX is great. I’m happy to see Kieron Gillen getting a chance to take Cyclops in a new direction despite his Uncanny X-Men ending (again) earlier this month. BEDLAM #1 – In honor of Halloween, I’m planning to try out Nick Spencer’s new horror series from Image Comics. CAPTAIN MARVEL #6 – I still have some catching up to do on this series, but I’m not crazy about seeing another return of Mar-Vell (the original Captain Marvel) after recent appearances in Secret Invasion and AvX: Secret Avengers. LOT 13 #1 – Another new horror series starting on Halloween. This one is from Steve Niles (30 Days of Night), Glenn Fabry (Preacher), and DC Comics. NEW MUTANTS #50 – I liked this book, but it appears to have run its course with this final issue. Unfortunately, it’s the type of book that should have a place in the Marvel Now! status quo as it really distinguished itself from the other X-titles. WOLVERINE AND THE X-MEN #19 – The Jean Grey School’s second year promises a lot of changes in the aftermath of last issue’s tragic ending. X-MEN: LEGACY #275 – It’s a bit surreal seeing the final issue of this book ship. It was Marvel’s longest running uninterrupted title (despite a few name changes) for a few months and I’ve been on board since #1. A new X-Men: Legacy is relaunching with a new focus and creative team next month, but it’s still tough seeing the original series end. Check back every week to see what’s on My Latest Pull List and please share your thoughts on these titles and everything you’re reading this week in the comments. Seven new books on my list this week. A-BABIES vs. X-BABIES #1 – This should be a fun showcase for Skottie Young’s art. It’s well timed with his set of “baby” variants for the Marvel Now! books. AMAZING SPIDER-MAN #696 – I’m enjoying the Hobgoblin story that’s unfolding here. Glad I decided to jump back in at #692. ASTONISHING X-MEN #55 – I’m several issues behind on this series. AVENGERS #32 – I haven’t been crazy about Brian Bendis’ Avengers for some time, but I really enjoyed the first part of End Times last issue. AvX: CONSEQUENCES #3 – Great follow up to AvX from Kieron Gillen. I have no objections to seeing it weekly. SECRET AVENGERS #33 – I’d forgotten how much I was enjoying this book before AvX. It’s great to see it back on track. TALON #1 – I hadn’t planned on getting this, but I’m giving it a shot. The “zero” issue was decent and I do enjoy the Court of Owls. Another big week with eight books on my list. AVX: CONSEQUENCES #2 – I’d forgotten this Avengers versus X-Men fallout series was shipping weekly. It should give Kieron Gillen an opportunity to wrap up the story of his “Extinction Team” from Uncanny X-Men as the current version of that series ends this week. CAPTAIN MARVEL #5 – I need to catch up on this series. I appreciate the $2.99 price tag, but not having a digital copy packaged with the book is part of what’s keeping me from staying current. CYBERFORCE #1 – It’s free! I’m a big fan of Marc Silvestri and the Kickstarter campaign is an intriguing approach. JUSTICE LEAGUE #13 – I’ve debated dropping this title but I’d like to see where the Pandora story goes and Tony Daniel’s art is enough to give it a chance. MARVEL NOW! POINT ONE #1 – Seeing this on the schedule for Marvel Now! week two seems like a momentum loss after all the hype around Uncanny Avengers #1. The $5.99 price tag isn’t helping. NEW AVENGERS #31 – End Times continues as Brian Bendis wraps up both of his Avengers titles. UNCANNY X-MEN #20 – It’s the “final issue” again, and I haven’t seen an replacement volume of the title announced for Marvel Now! It may actually be good for Uncanny to be off the table for a while. It’s too bad this was renumbered so recently after Schism. X-FACTOR #245 – Breaking Points has been some of Peter David’s best work and it wraps up here. 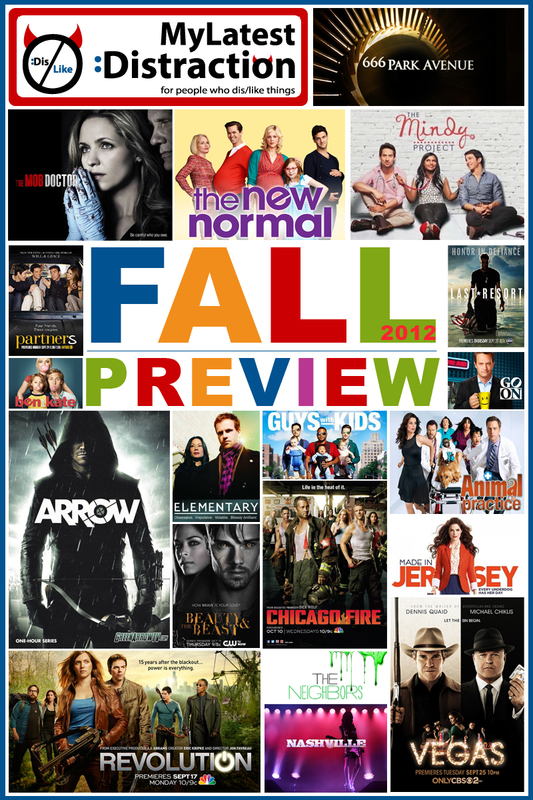 Fall premiere time is usually my favorite time of year, but this season I was a little underwhelmed by the new crop of shows. However, I agreed to check out a bunch of pilots so I could report back my thoughts. I was surprised how much I liked a few of these shows. I’m also quite surprised that a few of these are still around—I heard a rumor that Fox is holding off whacking the Mob Doctor until the World Series are over. Since the fall season started a month ago reviews & ratings for all of these shows are available, so we have a general idea of what shows are performing and what shows are not. 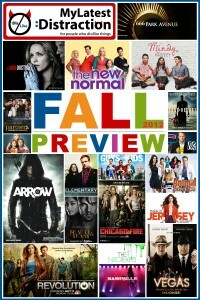 In my opinion NBC is one of the big winners this fall season as it looks like its comedy block is performing –NBC shows are performing so well in fact, that they are cutting shows slated as midseason replacements (Bryan Fuller’s Mockingbird Lane is now going to be a one episode special and the network recently cancelled Dane Cook’s Next Caller BEFORE it even aired). Anyhoo, I would say overall this crop of shows is stronger than I first thought, although I don’t think there is anything here that I would miss terribly if it went away (though I’m hoping after a few episodes I will be fully devoted to Nashville)… Read on for my reviews! I’m clearly late to the party in highlighting these items and Disney’s Avengers hit screens months ago and is now on DVD, but I just stumbled over them the other day. Grab Zags are another set of Marvel blind bagged toys. 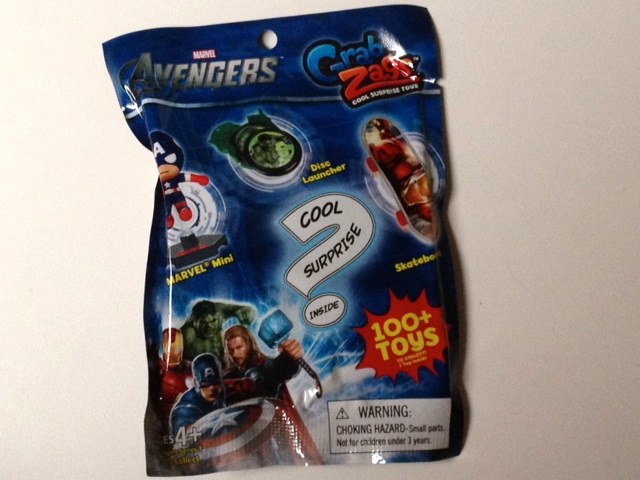 Each bag contains either an Avengers-themed finger scaled skateboard, disk launcher or “Marvel Mini” figure. As far as my recent search has dug up, there doesn’t seem to be any codes on the bag to decipher what’s in it. However, if you feel the bag it’s pretty clear which bags contain skateboards and disk launchers. Bags that contain disk launchers feel fairly flat. You can feel skateboard wheels in bags that contain them. Probably because I’m so late to the game, I’ve found that mostly what’s left in stores are disk launchers and skateboards. The bag advertises the possibility of there being 100 different toys in the bag. Based on the bag art, I’m not sure how that math works as I count 24 possible toys.